Ralph Irizarry is well known as one of the world's most "swinging" timbaleros, whose distinctive playing style has made an indelible mark on those artists with whom he has performed. Now, Ralph has created one of the most original and exciting new Latin jazz groups on the scene. He has created Timbalaye. Born in Spanish Harlem of Puerto Rican parents, Ralph is self-taught, learning to play from listening to his brother's music albums and sneaking into nightclubs at the age of 16. While still a teenager, Ralph's family returned to Puerto Rico, where he gained his first professional experience with groups such as La Terriffica, and sitting in with El Gran Combo, Sonora Ponceña and many others. Three years later, Ralph moved back to New York City where he began playing with local groups. One snowy Friday night in 1978, at Manhattan's Corso Nightclub he caught the attention of the legendary Ray Barretto, with whom he has made five recordings since. He has recorded with David Byrne, Paul Simon, Harry Belafonte, Earl Klugh, Juan Luis Guerra, Cachao, Celia Cruz and Yomo Toro. He is especially known for his work with Ruben Blades and Seis Del Solar with whom he recorded and toured internationally for 13 years. Ruben Blades has called Ralph "Innovative! Powerful! Irizarry leads one of the best Latin Jazz ensembles ever to perform in New York, truly outstanding in every way". Ralph was also instrumental in the creation of Seis Del Solar's two Latin Jazz CDs on Messidor Records. He is a sought-after studio musician who has played on countless jingles, film and television scores. Ralph's special charisma has also brought him an unexpected acting career. He appeared in the role of Pito Fernandez in the major motion picture "The Mambo Kings" and has also appeared in films and documentaries such as "Cachao", "Como Mi Ritmo No Hay Dos" with Andy Garcia, "The roots of Rhythm" with Harry Belafonte, and with Ruben Blades "The Life and Times of Ruben Blades". In the summer of 1996 Ralph Irizarry took his place as a master musician and solo artist in a presentation with Tito Puente at New York's SOB's club entitled "Master Timbaleros". This conversation between two drum masters was the culmination of 26 years of dedication, practice and undying love for the music. Tito Puente says, "Ralph is a star of the future who never forgets the Latin basics. His band is burning". Ralph's next step was the formation of Timbalaye, Latin jazz's most creative new group. A septet with a big band sound, Timbalaye combines contemporary Latin jazz with the latest tropical rhythms such as timba and songo, as well as more traditional Afro-Caribbean rhythm styles such as Bomba, Chacha and Son Montuno. Peter Watrous says "Mr. Irizarry, an explosive percussionist has changed the way Latin Jazz groups work, leading an ensemble instead of a group of soloists." Appearing weekly at New York City venues, the group's fresh sound immediately gained a strong following. 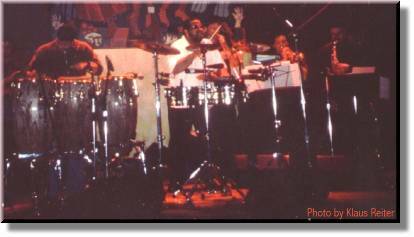 In October 1997, they appeared in an historic concert at Hostos College with the legendary Puerto Rican configuration, Batacumbele. They also recently finished recording a live at Birdland compilation CD for RCA records. Remarkable for its brilliance innovative arrangements and its players and arrangers which include Oriente Lopez (Grupo Afro-Cuba), Arturo Ortiz (Ruben Blades), and Juan Carlos Salas (of Venezuela's popular group Guaco). 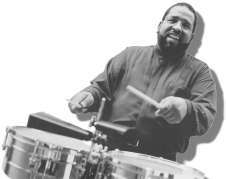 For lovers of great musicianship and original music, timbalero Ralph Irizarry and his group Timbalaye will be a force for the future of Latin Jazz. "It's exciting, smart music, a new way of thinking about Latin Jazz"
Copyright Klaus Reiter (klaus@salsaholic.de). Last updated: 8.12.98.